Goal Kickers – Johnson 4, Shaw 2, Hall 1, Fyfe 1. Best Players – Shaw, Turner, Willis, Johnson, Clark, Murdoch, O’Shea, Taylor. 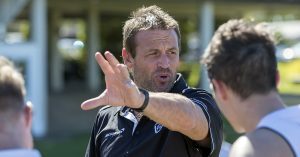 The Southport Sharks have survived a war of attrition to win at Aspley for the first time since Round 6, 2012. The day started disastrously with Manteit and Sheers both withdrawing from the team due to illness, then Ryan Davis injured his groin and was finished 10 minutes into the game. We kicked into the breeze during the first term and Aspley hit the ground running. Andrew Boston was copping plenty of attention and Matt Shaw was worse for wear after a heavy tackle. We were three goals in arrears until Mitch Johnson steadied the ship with his first goal. Johnson and Shaw kicked early goals in the second term and Shaw hit Fyfe for another meaning the gap at half time was only three points. We were back in the contest. Both sides battled for control in the third term but some horrendous finishing saw us add only seven behinds to the scoreboard for the quarter. The backline stood tall though and held Aspley to one goal three. We were five points behind at the last break but kicking to the scoring end. Coach Steve Daniel spoke to the players about their resilience and they were going to need every bit of it if we were to come from behind and win. Boston opened the scoring in the last quarter with a poster from outside 50 but Aspley goaled first to lead by nine. Hall and Shaw both goaled from set shots but Mitch Johnson was the difference in the final quarter adding two goals of his own to set up a seven point lead. His opposing Full Forward, Aspley’s Jono Freeman, missed a couple of critical set shots in the dying minutes and we managed to hang on for a drought breaking victory.